Now in its third year, Critical Visualities has grown into a major national conference, drawing top faculty from across the country in the fields of American studies, African American studies, visual culture studies, performance studies, media studies, and literary studies. 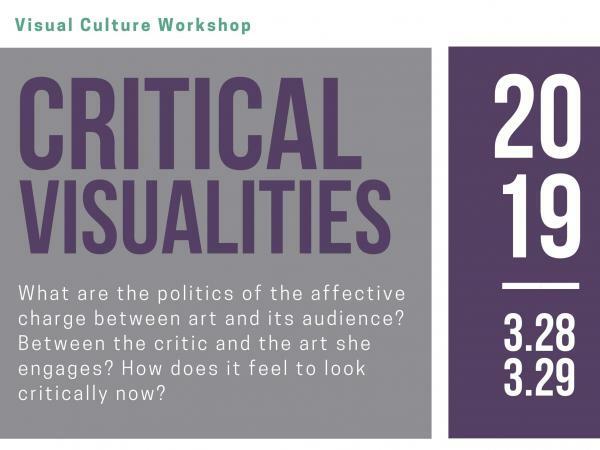 Designed to offer the University of Michigan community an unparalleled opportunity to engage with these scholars in an unusually intimate setting, Critical Visualities incites new insights, new questions, and new collaborations for presenters and audience members alike. As always, Critical Visualities is particularly attune to the ways in which our interdisciplinary work enables us to engage with current events marked by feelings of shock and urgency about ongoing racial injustice and gendered violence. Speakers include: Sarah Bay-Cheng (Bowdoin); Kimberly Juanita Brown (Mt. Holyoke); Zahid Chaudhry (Princeton); Laurie Gries (University of Colorado); Nicole Fleetwood (Rutgers); and UM's Sara Blair (English), Vera Grant (Deputy Director, Curatorial Affairs, UMMA), Joan Kee (History of Art), and Lisa Nakamura (American Culture).